This weekend, the AFL and NRL have an unusual alignment of stars – grand finals that feature the two most disliked, reviled and downright hated clubs in their competitions. As a result of this turn of events, both Sydney and Melbourne will feature the phenomenon of having a hardened group of supporters cheering loudly against the rest of their respective cities. The cries have been – Anyone But Manly or Collingwood. However, the presence of these teams in their respecting grand finals illustrate the health and passion of their competitions – in terms of the loyalty of the fans of the hated clubs, as well as in the heat of the opposition. Being from Greystanes, in heart of Parramatta territory, I grew up knowing clearly about the reason Manly should never win the rugby league competition. They were “silvertails”, a term coined by Roy Masters in the lead up to the 1978 Grand Final – as in Fibros (Western Suburbs) against the rich toffs of Manly. They were a club who were known in the 1970s for buying players from poorer clubs. They were, in the 1980s, the main opponent for Parramatta, even if they never won a grand final against them in that decade. Since that time, Manly have been accused of a variety of crimes, such as “killing off” the North Sydney Bears through the Northern Eagles debacle and having power over the rugby league competition when their former boss, Ken Arthurson, took over the ARL. These reasons have all combined to leave Manly where they are now – a deeply reviled and hated club. This is despite the presence of a salary cap eliminating any monetary advantage ; their near disappearance of a club before the appearance of property developer Max Delmege in 2002 ; their teetering on the edge of solvency, partially because their home ground, Brookvale Oval, possesses the unenviable place of being one of the worst appointed grounds in the NRL. Part of the dislike would still spring from the relative affluence of people from the region, when compared to supporters in Penrith, Parramatta, Campbelltown and Canterbury – but in a city as prosperous as Sydney, those differences would be seen more in housing values than necessarily disposable income. In schools and workplaces across Sydney, there is usually one Manly fan in every class, every office. They have, in my experience, developed a hard outer shell to the criticisms that are thrown their way. They aren’t silvertails – that’s the Eastern Suburbs Roosters, they’ll say. There’s a salary cap now. This is probably why if they win on Sunday, there will be some heavy triumphant celebrating continuing for some time, to the disgust of people around them. The same can be said for Collingwood supporters. Being a Sydney boy, I was dimly aware of a general dislike for Collingwood, but never really heard anything beyond a group of anti-working class barbs from the likes of Carlton supporters. Almost a Fibros-Silvertails style rivalry, which puzzled me as both communities are next to each other. Then I went to a Sydney – Collingwood game at the Olympic Stadium and was seated next to the black and white stripe that went from behind the goal posts to the top of the stadium. They featured the rudest, most contemptible opposition crowd members I had experienced – a label that continues until today. I’ll never forget the sight of Collingwood supporters standing near the eating stands at half time, swearing at Swans supporters, claiming we knew nothing of football and clapped behinds. It was not a good first impression. It is an impression that continues for many who have to catch trains with loud, triumphant Collingwood supporters. “Without teeth” as opposition supporters like to say, in a continuing piece of anti-working class stereotyping. 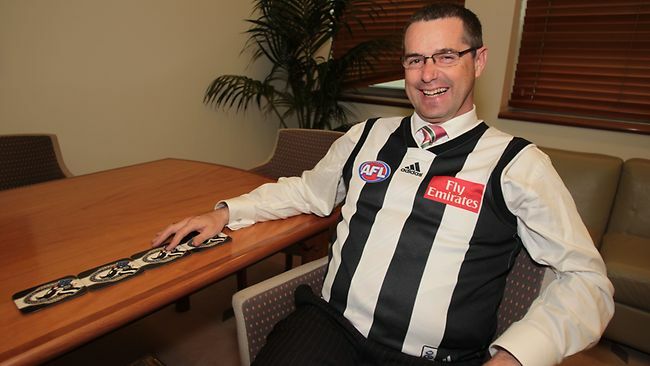 The club has had that type of stereotyping for a long time – and the dislike for Collingwood has been longer in developing than that for Manly. The helpful people at Things Bogans Like tweeted me this article from last year, illustrating that dislike for Collingwood springs from their status as a powerful club from the 20s to the 40s, like Manly’s dominance of the 1970s. That can be seen as smacking somewhat of jealousy of a more successful club more than any other reason. There is also a good case for the hatred to being part of a Protestant / Catholic sectarian rivalry, springing from the idea of Carlton and Melbourne being affluent, Protestant clubs and Collingwood being the rough, anti-establishment Catholic scrappers. These elements have created, like with Manly’s fans, a tough outer shell for its supporters as well as a perceived triumphalism when they win. Also not helping Collingwood’s cause is the open mouth of their President, Eddie McGuire, who seems to have a number of problems with the way the AFL is run. That has included a long running diatribe against salary cap concessions to Sydney and Brisbane – though, to be fair, that was in response to Collingwood being defeated by a better resourced Brisbane side. It also didn’t help that he was seen to wield too much power as host of the AFL Footy Show and President of its biggest club. It’s not a criticism delivered against James Brayshaw currently, though that’s possibly because North Melbourne are a club constantly on the brink of disappearing. McGuire attracts criticism mostly because his style drips of an arrogance and machismo that repels people – his hosting of the Winter Olympics in 2010 was evidence of that, as were his absurd “footy tax” comments in relation to poker machine reform. I have found, however, that there are sane, reasonable and personable Collingwood supporters – people who have all their teeth and gainfully employed – who are humble, serious supporters of the game and dedicated to their club. They have shown me the anti-Collingwood hatred is mostly built on hot air, irrational reasons and the actions of a few supporters who were either fools to start with, or have had enough of the anti-Collingwood hate. In the end, though, it’s not necessarily a bad thing having the pent up, irrational rage against the two more hated football clubs in the country. It gives people a reason to tune into the matches and get involved, cheering on Geelong and the New Zealand Warriors. It also demonstrates that the two football codes go beyond just being a television cash cow and being about genuinely held feelings, even if most people have no idea why they hate these two clubs with such vehemence. But, in the end, it is there to remember that the supporters of Manly and Collingwood are true, loyal fans to their club and to their football codes – they would have to be, in order to be hardened against the abuse and stereotyping. This doesn’t mean, however, that I want Collingwood or Manly to win. I have had a soft spot for Geelong for many years and I think it would be good for NZ to win the NRL. But if the hated clubs win, it won’t be that bad a thing in the end. Being also from a ‘fibro’ area, the hatred of Manly was well and truly stomped into this pommy immigrant child until it became instinctual. Back before the Illawarra had a team (and then lost it again), it was Ok to support any other team in the league, just not Manly. What I did learnt through all the amazing amount of info and stats analysis dedicated to a bunch of guys running about a field, is that whatever else could be said about Collingwood, they seem to get a very easy draw. Not being able to play all other clubs twice, each club plays some other clubs twice, and some clubs only once. Collingwood seems to get ‘easy to beat’ clubs twice, the harder ones once. It would be Ok if this advantage was allocated to each club in turn, or allocated randomly (it by definition has to happen due to the nature of the draw) but it seems to go to Collingwood year after year. Collingwood also benefit from a draw that seems them travel amongst the least amount of kilometres to attend away games. Work it out for yourself, and see that Collingwood, as a club, seems to play more games within the ‘local’ area, if not at home, than other Victorian clubs, and *far* more than interstate clubs. This, too, confers and advantage. And again, it seems to happen year after year. Less time spent travelling, plus a better than average draw gives them a double advantage. What that advantage is may be small, but its still unfair. And that is my ‘rationalisation’ for disliking (I am not that into AFL to ‘hate’) Collingwood.